If you want to get a million dollar smile then you must visit a dentist in Bangladesh. Yes, you’re right and a dentist can give good teeth, which is the most essential for a pricey smile. This is the profession that deals with the inspection and treatment of teeth, gums and other parts of the oral cavity. Also, taking care of problem affected teeth along with removal, correction, and replacement of decayed, damaged or lost teeth are the common duties of a dentist. Also, a dentist should some other duties, including carrying out the computer and magnetic resonance imaging, implants, tissue grafts, trauma, and laser surgery. Although the profession is creating many opportunities and challenges for job seekers, it’s changing rapidly with time. That’s why dentistry is one of the most desirable professions today. The first and foremost reason that most of the people look for in their career is high wages and flexible work schedule both are in the job of a dentist in Bangladesh. If you choose to start your own practice then you also get the opportunity to be your own boss. In addition to these, because you’ll never miss anyone who has not had problems with their teeth, dental care is a growing industry. On the other hand, for dentists in dental departments in hospitals, nursing homes, dental clinics, and health departments get excellent employment opportunities. Moreover, as there are many dental colleges across the country, you can seek a teaching job there. Furthermore, you can seek work in the research and advisory departments of pharmaceuticals as a dentist. And because it provides the best financial prospects, many dentists prefer private practice. 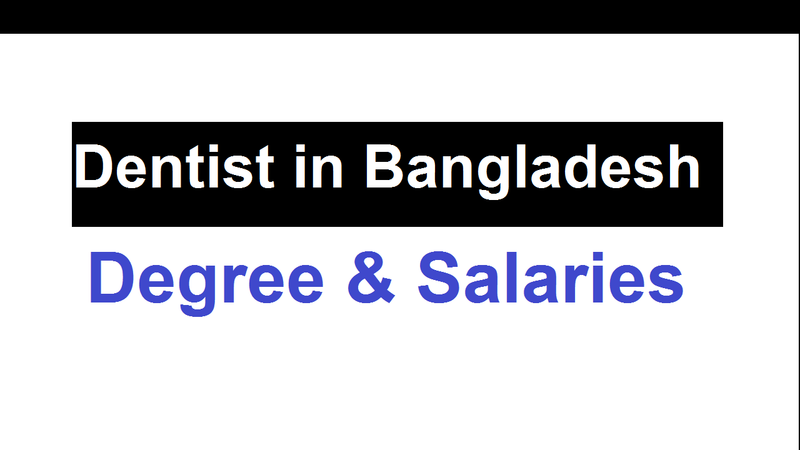 If you want to be a dentist in Bangladesh then you should have the degree of BDS. However, if you have an MDS degree it’s better and preferable in many organizations. On the other hand, depending on the basis of their skill and talent, the pay varies in private institutions for dentists and the salary ranges from BDT25000 – BDT40000. But, when it comes to the experienced doctors in the private sector, they can earn a salary ranging from BDT25, 000 – BDT1, 50,000 per month. In the overall health system, dental health is an essential part. Dental problems are becoming common among all sections of society with a modern lifestyle. In addition, it creates problems like early tooth falling, tooth decay, enamel loss, etc due to improper dental care. So, in order to keep teeth healthy and fit for a long time, all these problems require proper suggestions of dentists. This way, because of its promising nature, a lot of young aspirants are entering this profession dentistry has become more demanding as a profession. If you want to apply for the competitive entrance examination then you have to pass the 10+2 level with Physics, Chemistry, and Biology. Apart from this, let’s know other steps to become a dentist in Bangladesh. Divided into four parts each of one years’ duration followed by a year of internship, the Bachelor of Dental Science (BDS) degree program is a five-year course. Those who have completed the BDS to practice dentistry, the Dental Council of Bangladesh register them for practicing. Many graduates choose to join a government hospital after completion of this degree. As a BDS degree alone isn’t considered enough to succeed in this profession, you’ll have to go for a Master of Dental Science (MDS) degree. Throughout the duration of your practice, you’ve to keep participating in education programs based on your specialization. Also, in this profile, continuous education is an integral and essential part of a dentist in Bangladesh. No matter whether you’re a new entrant or have spent 40 years in practice, you can’t escape this aspect. When you join a mentoring program you may benefit from joining dentist mentoring, which supports aspiring dentists and guides them through the dental school admission process. Also, you can chance to participate in a dental college preparatory program. There are some colleges and other organizations that offer students enrolled in their first two years of college a 6-week dental school preparation program at a selected college or university campuses across the country. If you join this program then you can gain career development and financial advice, academic enrichment, and a first-hand view of dental work in a clinical setting. Students must take the Dental Admission Test before applying to dental colleges. Although a minimum score on this exam may be required to gain entrance to the dental school, the dental colleges consider the test scores, grade point averages, interviews, and letters of recommendation during the admission process. These are the selecting procedures while someone considers getting admission for the BDS degree. All dentists who have successfully completed their BDS degree, they must be registered with Bangladesh Medical and Dental Council (BMDC). Other than they will not be able to practice as a dentist in Bangladesh. If they do it then it will be considered a punishable activity. Some choose to specialize in a field of dentistry while dentists typically serve as general dentistry practitioners. While practicing in various specialties, Post-MDS or post-BDS education options are available to enable licensed dentists to practice in various specialties. Among the nine specialties recognized by the ADA’s Council on Dental Education and Licensure, oral and maxillofacial pathology, orthodontics and dentofacial orthopedics, dental public health, and pediatric dentistry are some to name. Before earning a specialty license, it requires entails 2 to 4 years of additional education, and in some cases, a residency of up to two years. As it’s said already there a dentist in Bangladesh should continue his or her study. So, you should not quite study and essential training after completing your degree. Also, new rules and methods are coming now and then, so you should be up-to-date with technology and knowledge in this profession. If you do it then it will help you to stay current with industry trends and expand their practices as professional dentists. Hopeful dentists must earn a professional or doctoral degree in dental surgery or dental medicine after earning a bachelor’s degree and getting registered in the BMDC.